I am very new to phone systems, but I would like to be able to wire this business up myself instead of having the boss hire someone. We need to make our two line Vonage system work through the already placed lines in the separate offices. I have taken a few pictures to see if you guys can help easier. 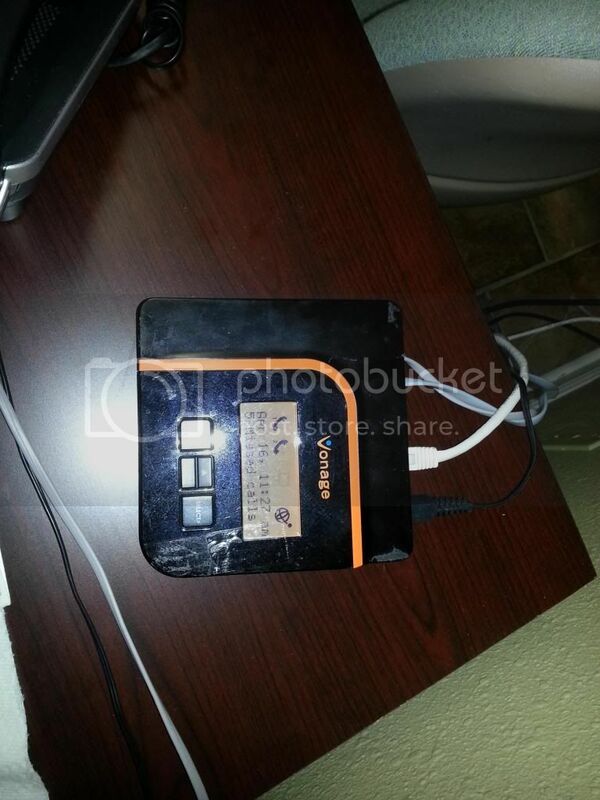 Here is the Vonage 2 line setup we have. I want at least 1 of the lines to route to all the rooms of the office through this closet. 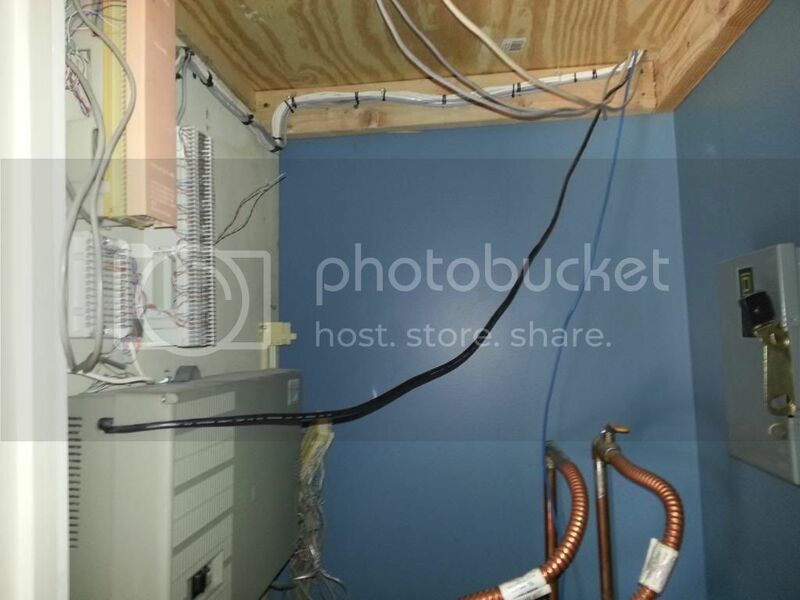 As you may see in the photo there is an old DHL phone system in there that is routed to an extra large connection block towards the back. Those will not be used. The small connection block and the larger one to its right on the forward side of the left wall is what I want to use and all that I think is needed. This is the large connection block and it has the individual offices routed from the top as shown. It looks like it has 7 lines that are bridged together for 1 or maybe two lines as shown in this picture. 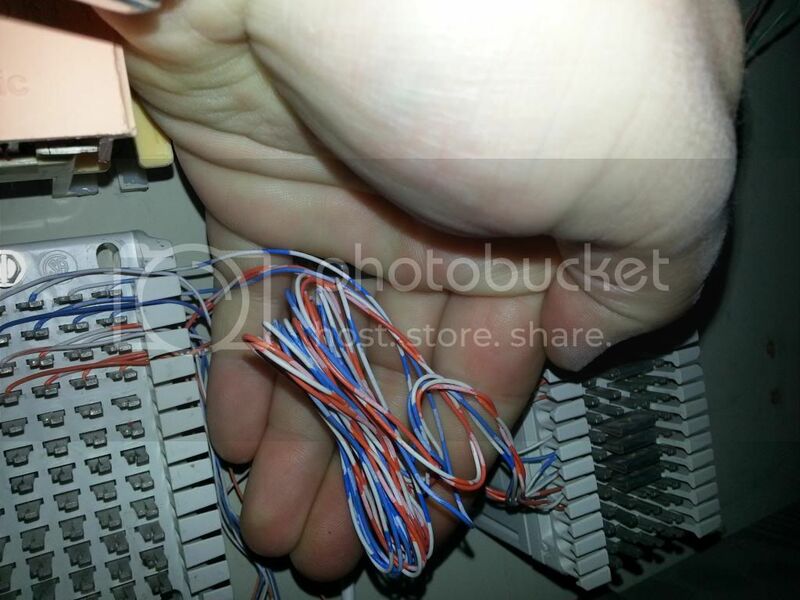 This picture shows how the large block is connected to the small block with white/blue and white/orange twisted pairs. These connections are made into the bottom connections of the larger block. 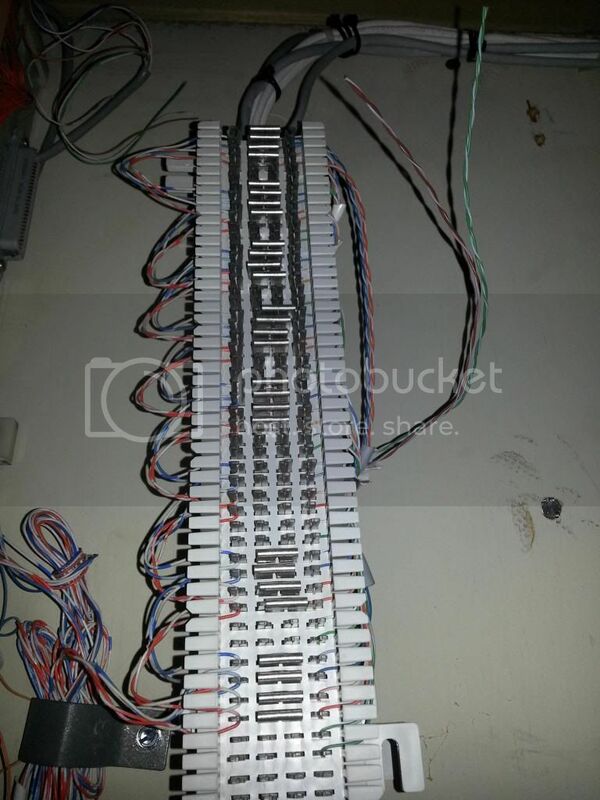 Then this picture shows how there is one white line that is connected to all 4 wires that come in from the larger block. 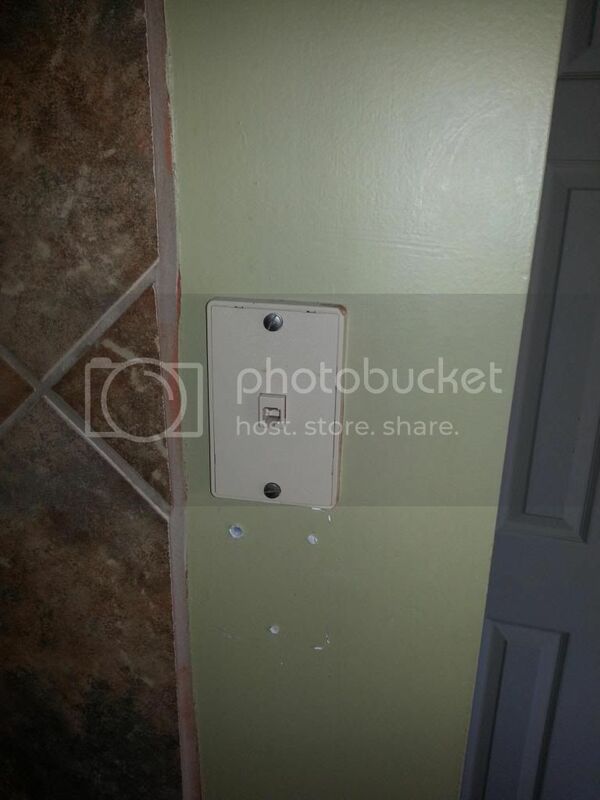 The previous pictures white line is routed through that wall and has a jack on the exterior of the closet. This is where I think that I can mount the Vonage system and run one of my lines into to route into all of the offices. If I put 1 Vonage line into the jack that is in the last picture, I think it will connect everything. I have removed the connection that was noticeably going from the AT&T box to the small block since I read that no exterior connections were good for this system. I also see 2 grey lines that I have no idea where they are routed to that can be seen in the closeup of the smaller block above. 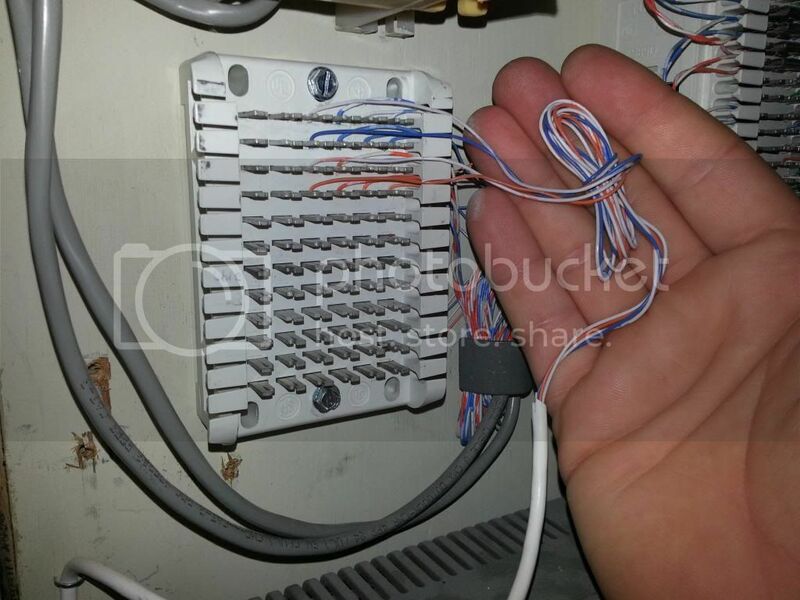 They seem to be connected into the same 4 wires as the exterior wall phone jack and the wires that are coming into the small block from the larger block. I think I need take these gray wires away for the time being just in case they are previous exterior connections. Also if you notice that I said the connection from the smaller block to the larger block is made into the larger blocks bottom connections of the larger block. I see one cable that has two twisted pair running to the top 4 connections of the larger block on the right side. This is the only different one as the rest of the cables have all 8 wires spread out on the larger board and connected individually. 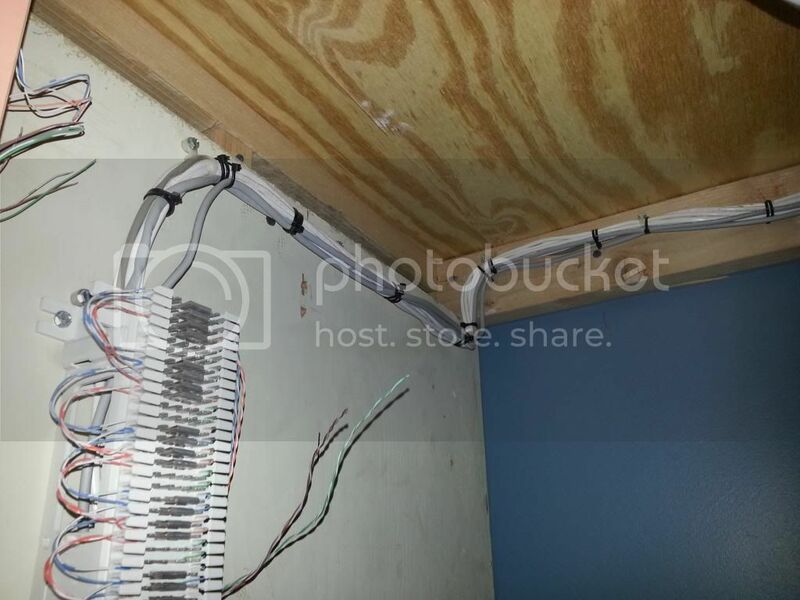 This one top connected line on the right side has only 4 wires, or 2 twisted pair, connected and the other 4 wires from the cat5e are just dangling as seen in the pic of the larger board. I don't know if this is routed to a room or if it is a primary line that was incoming from a previous phone company connection. I just think that I have read somewhere that the top connections are usually the primary line that is meant to be split to the other rooms. Maybe it can be done from the bottom and the top connection thing is just standard practice. I am just wondering if it will work with my configuration that is shown here. Also, as you can tell I am extremely new to phone systems and I would like it if you would correct my terminology so that I know the correct way of naming these parts in the future. Thank you for your time while reading this extensive post.